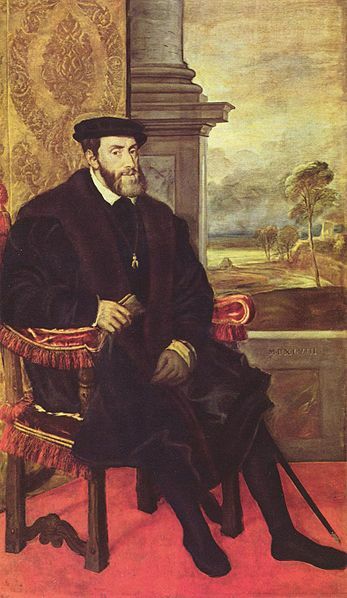 Having already resigned the sovereignty of the Netherlands in 1555, Charles V resigned Spain on January 16th, 1556. In theory, Charles V was the most powerful monarch in Europe. A Habsburg, in his teens in 1516 he inherited Spain, which had been united by his grandparents Ferdinand and Isabella. In 1519 he succeded his paternal grandfather Maximilian I as Holy Roman Emperor. He was Duke of Burgundy and Archduke of Austria and he also ruled the Netherlands, Bohemia, Hungary, Naples, Sicily and Sardinia. Ruling Spain meant ruling Spanish America and in Charles’s time Cortés took Mexico and Pizarro conquered Peru. The wealth of Spain paid for his efforts to control western Europe. A fervent Roman Catholic, Charles hoped to unite all Europe in a Christian empire. Not only did the French and the English prove resistant to the idea, however, but in 1517 Martin Luther nailed his theses to the church door at Wittenberg: Charles’s ambitions foundered on the Protestant Reformation. The Emperor’s health began to fail in his mid-forties and he suffered agonies from gout. He had been considering abdication long before it became clear, in the 1550s, that Protestantism in Germany would have to be tolerated. It was not something he could accept. He handed the running of the Holy Roman Empire over to his brother Ferdinand in 1554, and in October 1555, in the Hall of the Golden Fleece in Brussels, he resigned the sovereignty of the Netherlands to his son Philip of Spain, asking those present to forgive him if, from the love he bore them, he shed some tears. Some of those who heard him shed them too. The following January he resigned Spain and Spanish America to Philip. In August he formally abdicated as Holy Roman Emperor. Charles hoped that Philip would eventually rule his whole empire, but the empire was too big to manage, Ferdinand and his son Maxmilian refused to accept Philip’s succession and the Habsburg dynasty split into Austrian and Spanish branches. Charles himself spent his last days in Spain in a house close to a monastery, with a household some fifty strong. Visitors kept him in touch with events and he did his best to ensure the continued persecution of Protestants. He had taken his favourite books and pictures with him and he enjoyed shooting pigeons and tending his garden until his death in 1558.